Red color is related to Base chakra of a human body. 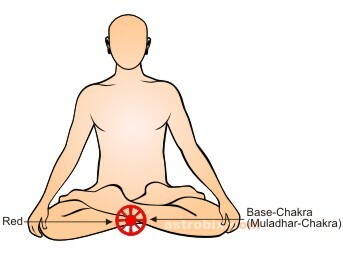 This chakra is located at the end of spinal cord. The organs related to this Chakra are:- Kidney, bladder, hips, vertebral column , legs. The endocrine gland related to this Center is, adrenal gland. At the spiritual and mental level, red color is related to the individual’s self-awareness. Staying aware as a human being and maintaining your status on earth is the significance of this Chakra. This Chakra is the area of individual’s existence. It is the area of his survival. This centre is related to a man’s basic instincts. Red color offers courage, strength, energy and power. This color is concerned with stability and security. When the red color is in balanced in the human body, the person turns out to be courageous. He has a passion for moving ahead in life. The person has all the qualities of leadership. He has a strong will power, so he is not afraid to do any work. He has faith and confidence in himself. He is full of energy. His ideas are strong and determined. He works according to his own wish. If the base center is unbalanced in human body, the following problems can occur:-piles, diarrhea, numbness in the fingers of hand and foot, frequent urination, high blood pressure, stone formation in kidney, constipation, colitis, impotence, problems related with hips, disorder related to feet and legs. Red color is the last color of visible spectrum. This color is known as warm color. Red color communicates, excitement and energy in a person to perform a task. The color helps to remove fatigue and laziness. It is useful in controlling of low blood pressure. Helps to increase, dormant blood circulation. Communicates energy and power. Red color increases the blood flow in case of hypertension or high blood pressure. In such a case pink color is used for medication. The positive aspects of red color:- boldness and courage, strength and feeling progressing. The most negative aspects of this color:- anger, violence and cruelty. The use of colors in home, keep the environment in equilibrium. Red color gives energy and stimulates our feelings. This color can be used in all sort of activity rooms. Red and other colors having reddish essence in them, are warm and comfortable for a person. Include a red colored clothing item or accessory in your attire regularly. Keep a red colored piece of crystal or glass in your workplace, or in your home. Use a red colored night-dress so that you may benefit from the energies while you sleep. Use red colored bulb or night-lamp. If you don’t find a red colored bulb, you can use a red colored film to wrap around a regular white bulb. Include red color in your home furnishing. Visualize the red color in your head during the day.